While AirMedia is one of the most recognizable products for wireless collaboration, Solstice’s superior enterprise management tools and integration options make it more deployable and manageable at scale. Solstice releases features more rapidly, delivering more continuous value to Solstice customers. AirMedia’s product development cycles are slow in comparison to Solstice’s software release schedule. Since Solstice is software based, additional features can be added to the product more efficiently and at a quicker pace. Solstice is the most feature-rich solution in the wireless collaboration category, and much of this is attributable to the fact that Solstice is a software-based product. Since its inception Solstice has outpaced the competition in adding enterprise features such as room scheduling via calendar integration, Quality of Service (QoS) support, a comprehensive 3rd party integration API, and most recently digital signage. Solstice can be deployed on-network without an Ethernet connection, AirMedia can not. Solstice is built for the modern day meeting space based on the fact that it can be deployed in any type of meeting space, regardless if there is an available Ethernet cord available. This includes traditional conference rooms, but also individual offices, transitional spaces, huddle spaces, or anywhere with a display. 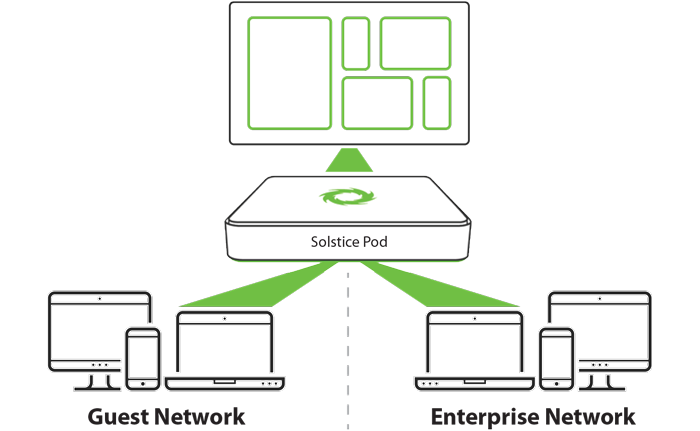 The Solstice Pod includes both wired and wireless network interface cards (with separate routing tables) providing a range of network connectivity options – including dual network mode for secure collaboration among users on primary and guest networks. AirMedia can only be deployed on a network when an Ethernet cable is present and cannot be deployed securely on dual networks, so users on your network and guests cannot share content on the same display without giving the guest network access. Both Solstice and AirMedia offer a centralized, one-to-many management platform, which is critical for an enterprise-scale deployment. However, only Solstice offers its Dashboard as part of its Enterprise solution. Crestron’s Fusion monitoring platform is available at an additional cost. Only Solstice has a robust API that allows you to integrate your collaboration solution with existing infrastructure like room control panels or 3rd party dashboards. Additionally, AirMedia is only compatible with Crestron touch displays. Solstice is a more feature-rich, enterprise-ready collaboration solution at a lower price point – with zero hidden costs. Try it today!